Was it okay for Bernadine Evaristo to write this book? I ask this question in light of the ongoing controversy over cultural appropriation, specifically who has the right to write about whom. If you haven’t been following this issue lately you might want to check out Lionel Shriver’s keynote speech at the Brisbane Writers Festival and Yassmin Abdel-Magied’s essay explaining why she walked out on Ms. Shriver’s speech. Both do a good job explaining their position–reading them will give you a pretty good idea where folks on both sides of the issue are coming from. I can see validity in both points of view, but I tend to come down on the side of more art. Make more art. If you don’t like the art other people are making, make your own. I do agree that folks who are writing about characters outside their own experience should do their research, should read what they can, talk to people, visit places, experience what they can experience. But I also suspect that writers who shy away from characters or stories because they are outside their immediate experience are probably mediocre writers. If a writer has a story to tell, they should tell it. Tell it as well as they can. Even if it includes a culture not your own. 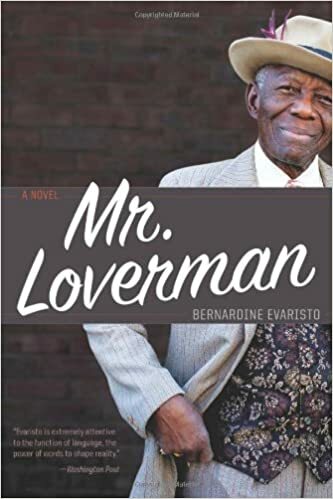 Which brings me to Berandine Evaristo’s wonderful novel Mr. Loverman. Mr. Loverman is the story of Barrington Jedidiah Walker, a 74-year-old man from Antigua who has lived in London most of his adult life. Barry became a very successful man–he currently owns many London properties which he bought back in the day at rock-bottom prices. He has two adult daughters, one whom he spoils and one who hates him nearly as much as his wife does. Barry spends as much time as he can with his childhood friend Morris. Barry’s wife suspects that he has been seeing a series of women all through their marriage, that he cheats on her almost daily with these women and that he has no love at all for her. The truth is that he has loved only Morris since they two were boys back in Antigua. Barry and Morris have had to hide their love all their lives because to be a gay man in Antigua is so terrible an offense it is life-threatening. Should their families find out, chances are they would all turn their backs on them as would their communities. This is why they have had to live a double life for nearly 60 years. Barry is the narrator of Mr. Loverman. He’s a great narrator. I would love to join him for a pint or two sometime. He’s charming, he’s funny, he’s got a great wit and a great way of looking at the world. An autodidact he loves showing off his knowledge and his vocabulary but always manages to do it in a way that charms. He won me over in a matter of pages. True, he is more than a bit mean to his wife, whom he really should never have married in the first place. And he may not be the best of fathers. But here’s the thing. Ms. Evaristo is not a 74-year-old closeted gay man. She may or may not be from Antigua, I don’t know. The biography on the back flap says she lives in London and writes about the African Diaspora. She may or may not be a lesbian: I don’t know. From her picture on the back flap, if we can trust that is really her, I know that she is far from 74-years-old. Old age, like death, is another country. But how much of this story has to be “hers” before she can tell it? She’s done a great job, as far as I’m concerned, but I share only two forms of identity with Ms. Evaristo’s narrator, so I’m not the person most capable of judging. I haven’t even spent enough time in London to know if she gets the setting right, butI found all the characters in Mr. Loverman to be realistically portrayed. I believed them all. I liked most of them, too. Did Ms. Evaristo research this book? did she run it by various readers to check her portrayals for accuracy? for sensitivity? I do not know. What I do know is that Mr. Loverman is a terrific novel. I’m glad Ms. Evaristo wrote it; and I’m glad I read it. Sounds like a great book and definitely an interesting post. Thanks for pointing me to the two posts, I had heard of the controversy, but had not read the sources. Going in, I would have agreed with Shriver, but she sounded so condescending. I like the way you say it better, “If a writer has a story to tell, they should tell it.” And do the best job they can. I hate to think she’d lose the argument because of her tone, though I do agree with you about it. I still feel like I have a boot in both camps. People should be concerned about how they tell stories outside their own experience, but they should certainly still tell them. And wear whatever kind of silly hat you want when throwing a party. The guests are all perfectly capable of mocking you should mocking you be called for. Previous Previous post: It’s Talk Like a Pirate Day! Next Next post: Sunday Salon: Catching up with This Week’s Reading and Lionel Shriver Wears a Funny Hat.